The Six of Wands. Victory. Triumph. Acclaim. Pride. Nationalism. Accomplishment. Lasting order. The Six of Wands corresponds to the Sefirot of Tiphareth: Conscious Harmony. Whereas Kether is the original harmony of the Suit – the unconscious harmony – Tiphareth is the conscious harmony, which comes to understand that Chesed and Geburah are two sides of the same thing. This revelation brings about Tiphareth, which is in many ways like a toned-down Kether; if one looks at the Tree of Life, you can see that Tiphareth is the only Sefirot other than Chokmah and Binah that receives any energy of Kether. As such, after chaotic motion of Geburah, the light of Kether brings about realization and a conscious, explicit harmony to the Suit of Wands. In the Naples Arrangement, 6 is Experience; the Experience that brings about harmony. The Six of Wands, then, is the combination of the Four and Five; of Completion and Strife, given a positive, enlightened spin. Conflict (Five) is brought to Order (Four) to bring Triumph and Accomplishment. Adversity (Five) comes together with Celebration (Four) to bring people together into groups, and the sense of Accomplishment (as a Group) and Group Pride rise out of this. Competition (Five) allows for the best to rise to the top, and Security (Four) provides for everyone else, giving everyone Lasting Order. Tiphareth restores balance and stability (as can be seen in the card’s meaning of Lasting Order) to the Suit of Wands and Element of Fire through experience and realization. As the center of the Tree of Life, the Sefirot of Tiphareth also represents the central balance of the suit, as all of the energies above Tiphareth flow into it, and Tiphareth flows into all below it (save Malkuth). As such, in many ways, Tiphareth represents some of the best the suit has to offer (the Sefirot Yesod performs a similar role). It is at this point that the previous elements of the Suit of Wands all come together: the power of the Ace and Dominion, the qualities of Virtue, the joy of Completion and the conquest of Strife. As such, Victory represents group accomplishment, pride, unity, overcoming adversity, security, and permanence. In many ways, this card is a (weaker) and more stable version of the Chariot (VII). This card showcases many of the best aspects of the Suit of Wands. 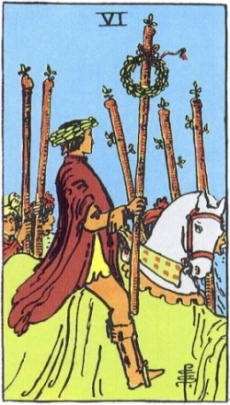 The Rider-Waite art shows a very Caesar-esque figure, upon a horse with an ivy wreath upon his head and holding aloft a wand proudly, surrounded by others doing the same, illustrating and stressing the fact that this card is not about individual accomplishment, but rather that of a community or group. The Thoth illustration depicts six wands crossed in a grid, with a steady flame – not violent emanations any longer – burning in the squares of each, telling of strength through unity and stability. It is also interesting to note that the Wands with bird-like heads here are facing up now instead of down (like they were in the Five of Wands) – looking up to Kether’s influence. In a reading, the Six of Wands indicates that you should be looking to those around you to help you overcome your mutual goals, and have a sense of pride in terms of where you are and what you’ve accomplished with those around you. Embrace your group identities and work with the team; through teamwork and passion you will overcome adversity and achieve victory, and one that will last. Reversed, this card asks you to look at how you may be focusing too much on your individual pride and accomplishments, and to instead look at how you fit in with the pride and accomplishments of those around you; maybe you have achieved a victory, but its effects will not be permanent, or you will have done it by yourself so that you will not have the joy of truly sharing your triumphs with those around you.